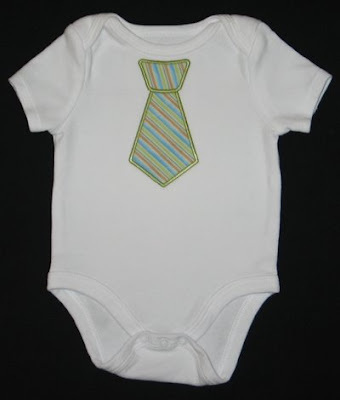 Susan requested a tie onesie to give as a baby gift. 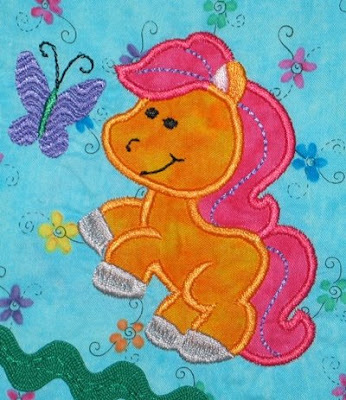 The embroidery design is from GG Designs. One of Carlin's best friends back home recently had a baby girl. 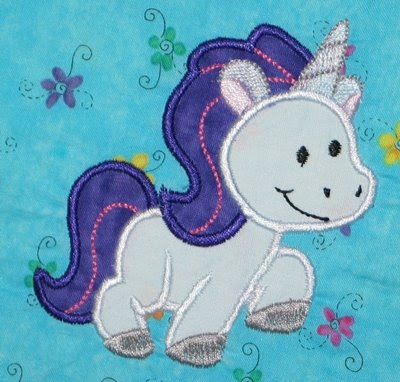 It took me a couple of months, but I finally got a gift stitched and in the mail. 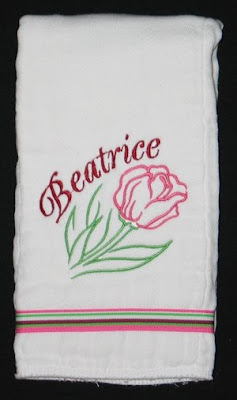 Her name is Beatrice Rose, so I did this burp cloth for her. 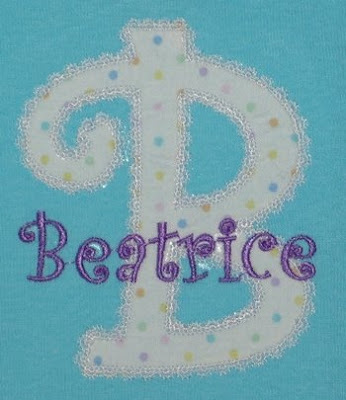 The flower is from Embroidery Library and I used Embird Alphabet #38 for her first name. 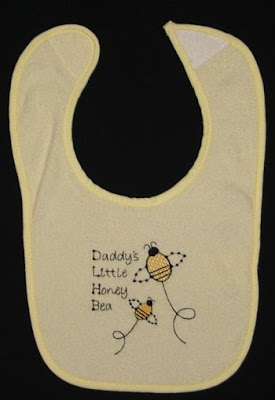 Patrick calls Beatrice his Little Honey Bea, so I made this bib. The bees were from Sew Forum and I used an alphabet I have from Oregon Patch Works (I can't find direct links for either of these). 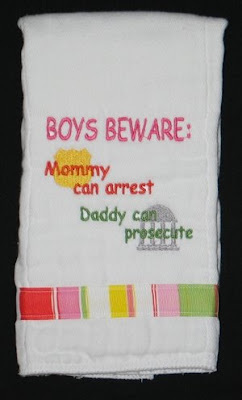 Patrick is a lawyer and Jenny is an officer, so I thought they might get a kick out of this idea. 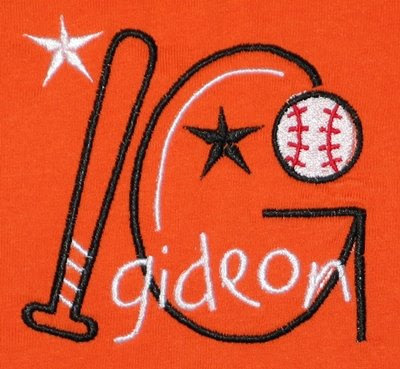 The badge and capitol building are from Embroidery RN Designs, and the text was added with Embird Alphabet #4. 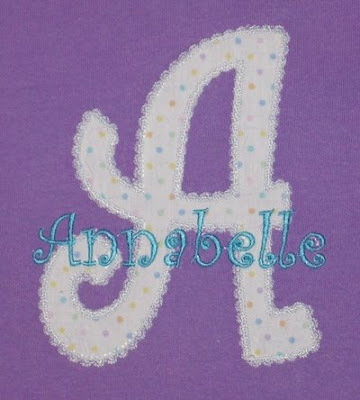 The Curlz applique monogram is from Embroidery Boutique. I added the text with Embird Alphabet #17. 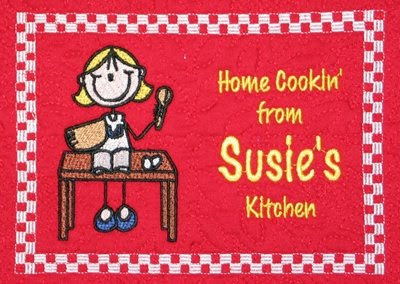 Today Annaliese's class celebrated Ms. Susie's birthday. They each signed a cute card (amazing how those signatures have improved over the year!!) and we presented her with a group gift. 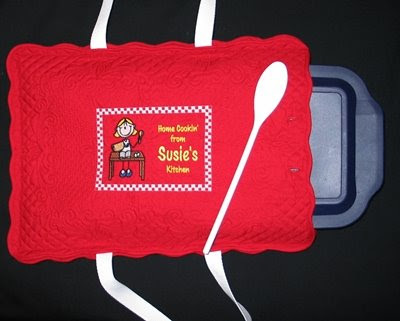 I made a personalized casserole carrier, and another mom made a cake in the covered pan we purchased as part of the gift. 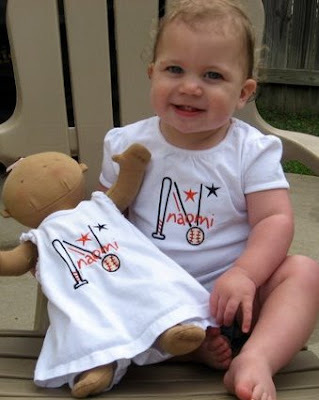 She LOVED it, it was so fun to watch her open it. 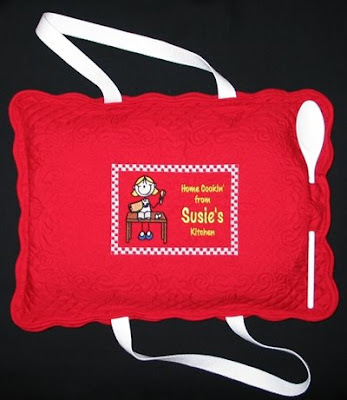 The stick figure design is part of a set from Artistic Thread Works called Daily-Chore-Sticks Embroidery Design Set. 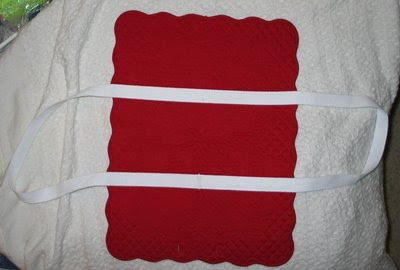 The checkered border is from Embroidery Garden. I added the text with Embird Alphabet #8. I really like how it turned out. 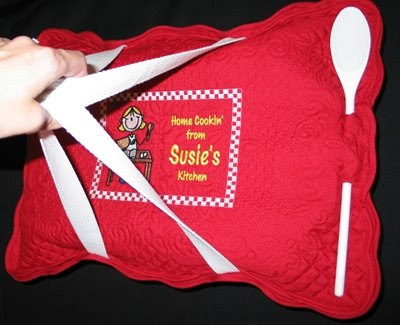 Some day soon I'll have to deconstruct mine and add the handles and buttonholes for the spoon! 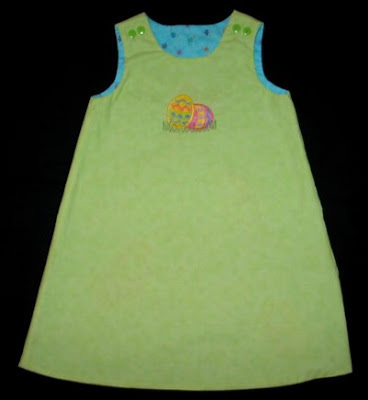 I made Annaliese a reversible A-line dress for Easter (using Martha Pullen's pattern). 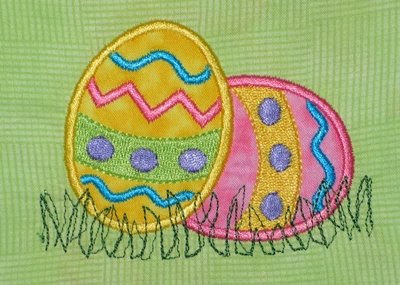 The Easter egg applique is from Sew Many Designs. Annaliese is really into My Little Pony right now (see her Easter basket and you'll know how excited she was this morning!) 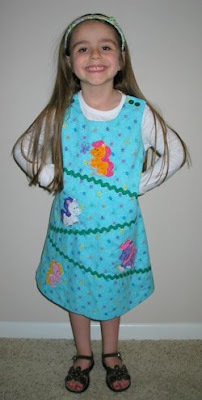 so I decided to make her a pony dress using the appliques from Designs by JuJu. 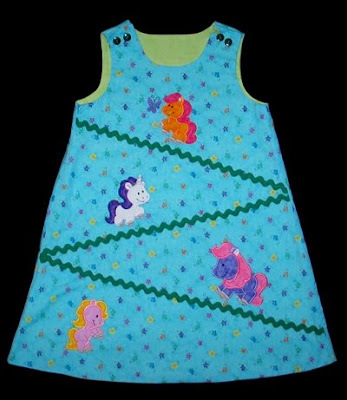 I used rickrack as grassy hills to help divide up the dress. 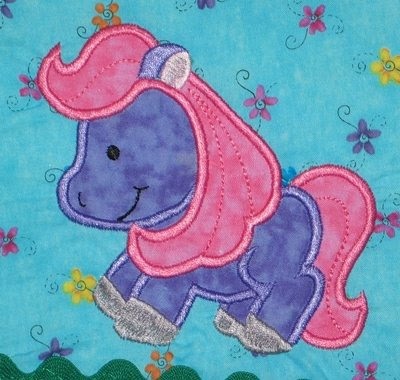 Annaliese and I picked fabric and threads to match four of her favorite ponies. 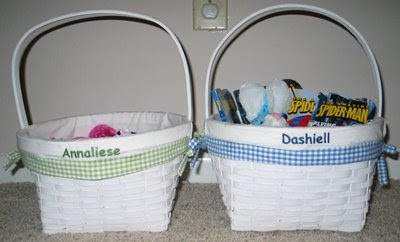 I couldn't find a cheap Easter basket for Dashiell that looked like the one we bought for Annaliese four years ago, so I decided to go all out and get them nice matching baskets that will last for years to come. 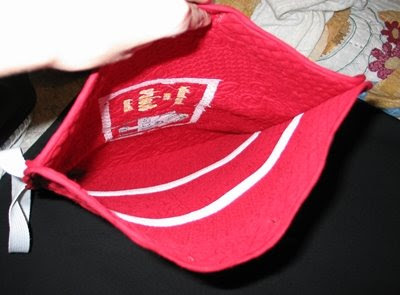 Purchased at Jo-Anns, they came with the liners. 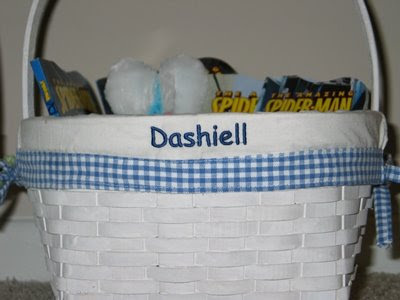 Much like Dashiell's Christmas stocking, these new Easter Baskets didn't get monogrammed until 10pm before the morning they were needed! But they turned out even cuter than I expected! I used Embird Alphabet #4 (Comic Sans) for their names. 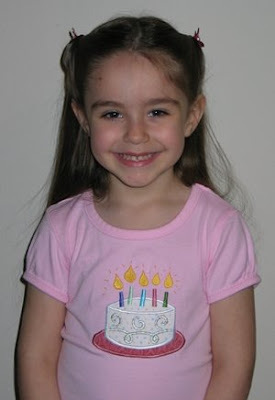 Today is Annaliese's fifth birthday! It's an especially Good Friday! 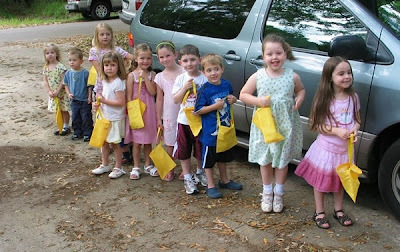 I hoped to have a little gathering on her actual birthday, but was afraid lots of her friends would be out of town for Easter. Would you believe that virtually everyone said they could come?? 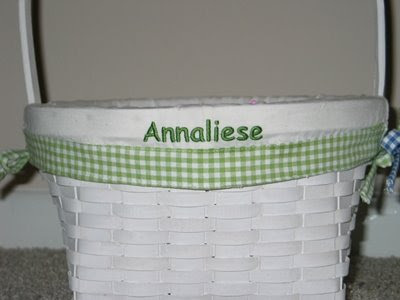 How fun for Annaliese! When I asked her about a theme (expecting her to say "My Little Pony!!") 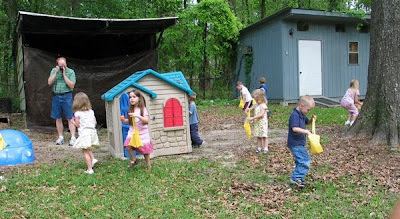 she said she wanted to have an Easter egg hunt. Easy enough! 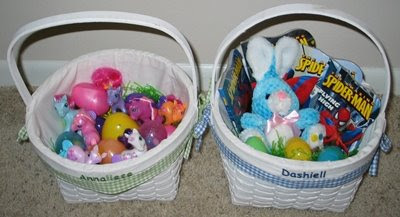 In lieu of requesting everyone bring their Easter basket or buying goody bags, I decided to whip out bags the kids could use for the egg hunt and then take home with them. 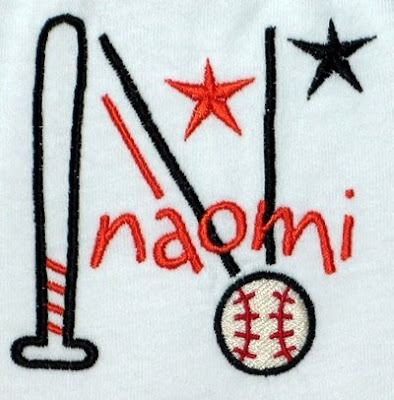 Of course they had to be personalized... this created self-inflicted stress, mainly because we had thunderstorms all spring break and I didn't run my embroidery machine for 7 days straight. 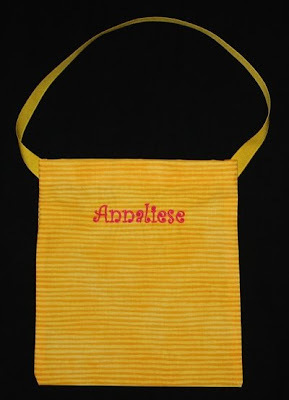 I was rushed this week to get Annaliese's Easter dress made (expect a post later this weekend) as well as these bags. But they are cute, and I'm glad I did it. 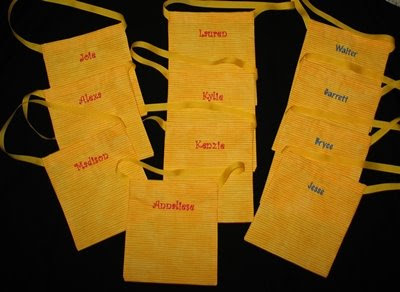 Expecting ten guests plus Annaliese, I made eleven bags total. 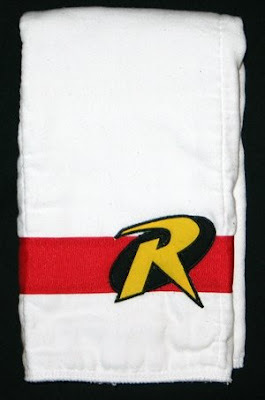 Each is made from one fat-eighth and 20" of grosgrain ribbon. 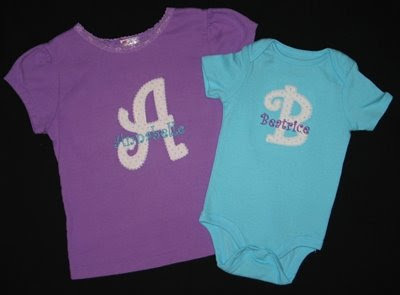 I used Embird Alphabet #8 for the boys and #17 for the girls. 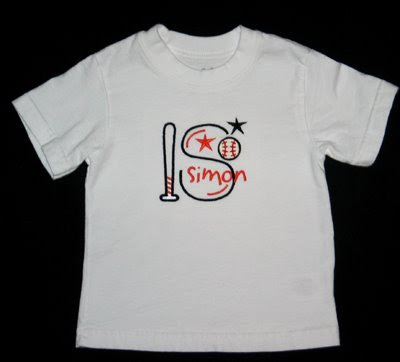 Ready for Opening Day, again! 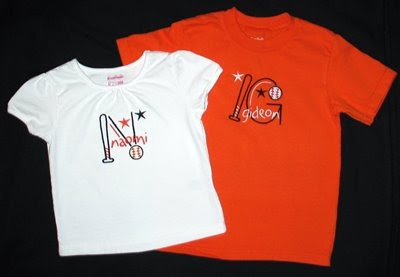 Last year I stitched matching shirts for Debby's grandkids to wear on Opening Day of baseball season. 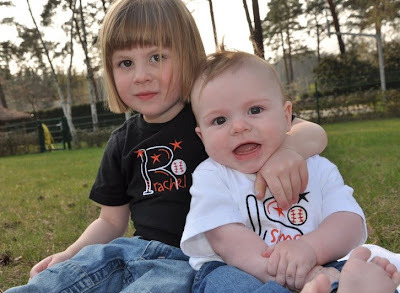 A year has passed, there's a new grandbaby, and the rest are getting bigger! 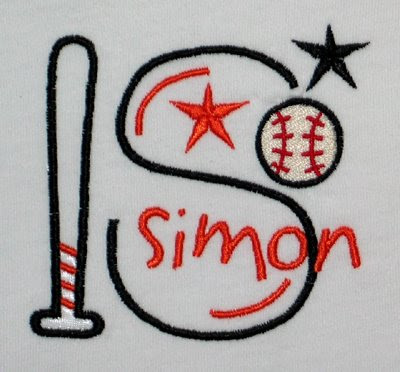 The baseball monograms are from Five Star Fonts. 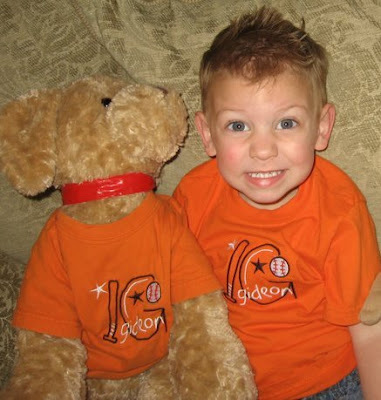 Rachel's shirt from last year still fits, but she sure looks older! Ok, I couldn't pick just one from each family, so here you go... sibling pairs and individual shots. 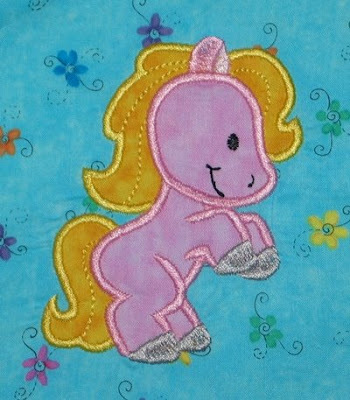 You can see more precious pictures on the Sheets' blog. 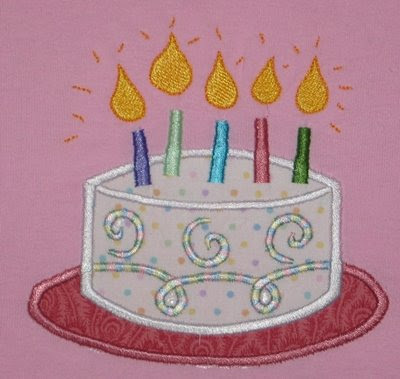 Annaliese's birthday is Friday, so I stitched her birthday shirt this weekend. 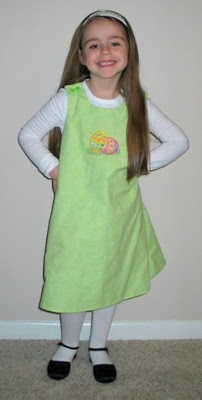 I picked fabric/threads to match this skirt we've had for quite a while. 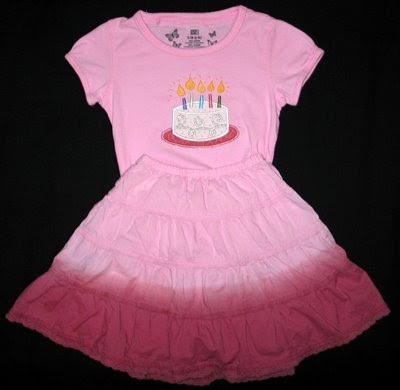 On to stitching birthday gifts and her Easter dress! 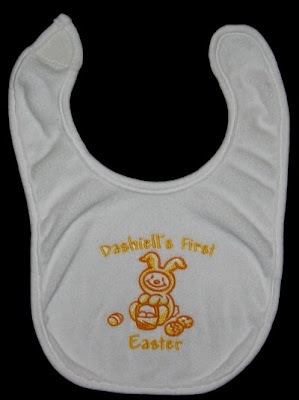 This weekend I stitched Dashiell's First Easter bib. 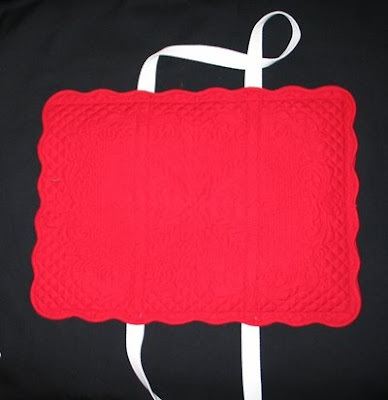 The design is from Embroidery Library, Kathy did the text for me again. 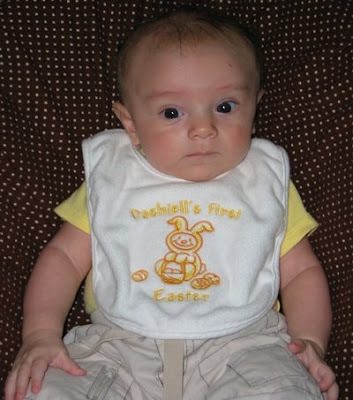 It's amazing how much he's already changed from his first Valentine's Day and St. Patrick's Day. I can't wait to compare the pictures when I get the whole set done. Next up, Fourth of July. Whew... that's a little bit of a break!